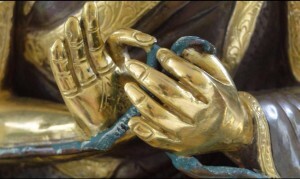 Our primary daily practice is Heart Jewel, combined with meditations on the stages of the path (Lamrim) and Mahamudra; twice a month we have special prayers called Offering to the Spiritual Guide; and we also do some prayers on a monthly basis, such as, Kangso or (Melodious Drum) and Liberation from Sorrow. For those who have received a Highest Yoga Tantra Empowerments, there are twice weekly Highest Yoga Tantra prayers. Note: At certain times during the year (e.g. : over the Christmas period), some sessions may not be held, so please check the calendar for specific details. Tuesdays, Wednesdays and Thursdays: 7.30 - 8.30 am..
10th and 25th day of each month. (Please call the centre one or two days beforehand to check times). We can also arrange special pujas for specific individuals. Please contact Demo if you would like to do this.